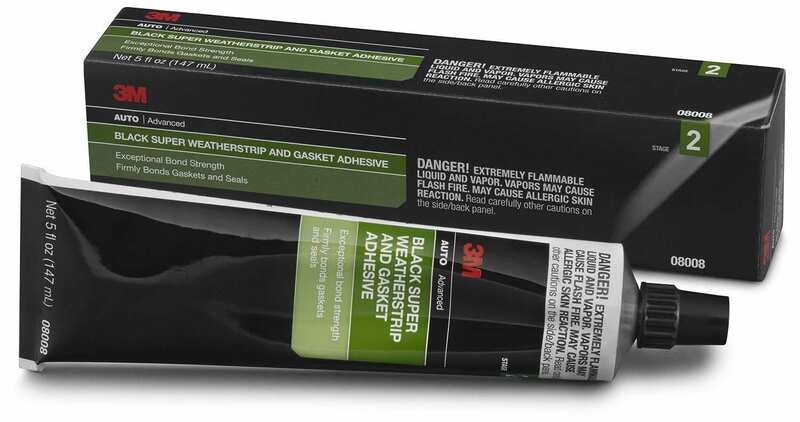 3M Black Super Weatherstrip and Gasket Adhesive is a strong, flexible adhesive that can be used to bond automotive weatherstripping to vehicle doors, trunks, t-tops, sunroofs and more. It resists oils, solvents, detergents and can withstand vibration and extreme temperature variations. It is a great adhesive for holding paper, cork, or rubber gaskets in place during installation as well. It bonds permanently to a large variety of surfaces including rubber, fabrics, gaskets, seals and metal. The weatherstripping adhesive is very easy to use. Simply squeeze it right from the tube, easily brush and spread as needed on each surface, and let it cure for up to 24 hours. The adhesive remains flexible, yet it resists nearly any condition you’re likely to encounter in your vehicle — wind, rain, vibration, temperature changes, detergents, grease and more.